David Orrell gave the McLuhan lecture 2015 at the Transmediale in Berlin under the title, Money is the Message. He started his talk with the argument that although money has been the main driver behind western culture, it rarely appears a word among economist, who according to Orrell do not acknowledge the complex nature of money. Historically money emerged as of the credit system as means to track debts by the ancient Sumerian civilization in Mesopotamia. Orrell argued that it is false that money appeared as a general medium of exchange. This is rather a media function of money as it is to be a storage for wealth. Money is transmitted as objects with a physical aspect, coins, bills, notes, transfers, which have stamped a virtual number. 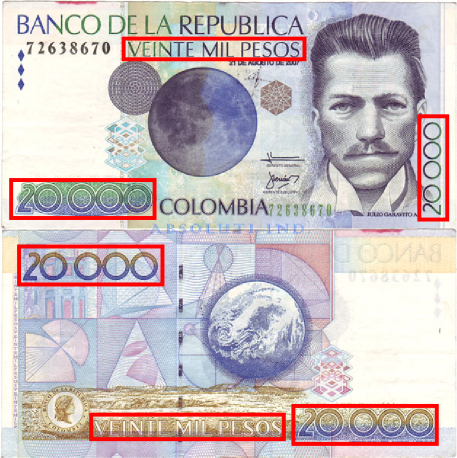 e.g., the Colombian 20000 pesos bill has 6 times in two different forms the number it represents. This Colombian bill uses 6 stamps to identify its value. Matter and number make money a medium in constant tension with one foot on the physical world and one on the virtual world. A duality that is not that far from McLuhan’s message – medium binary system, and coincides with the series of comparisons that I’ve collected here. Money oscillated between its two poles, physical and virtual. Orrell traced this oscillations in history in five moments. Where is then money? is it on gold blocks, houses, bills? is it on credits and numbers on a screen? Money is unstable, irrational and always points to the number to the quantification of the physical world and the relations we establish with it and among us.